Satsuma's Satsumaimoes hit the streets! 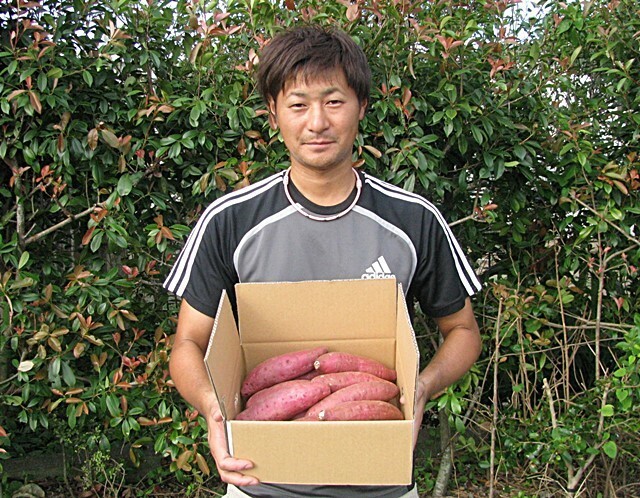 (Sweet-potatoes in Satsuma-peninsula are coming up!) The kind is Beni-Satsuma. 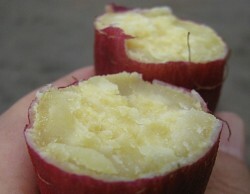 The most common sweet-potato. 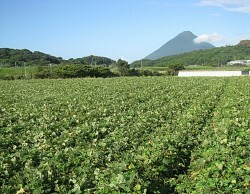 It is cultivated in the area called "Yamagawa in Ibusuki-City", which is one of "the best 5 fertile field areaes in Japan" as of "yield amount per acre by open culture". 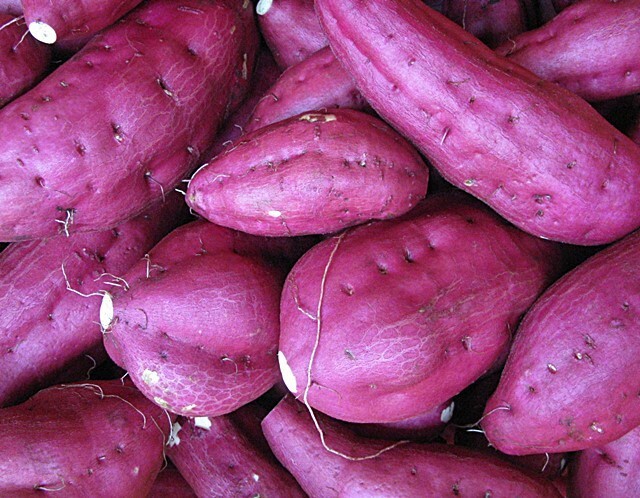 It is "an excellent sweet potato having much jalapin ingredients". It was brought up with much love of three-generation family. They will deliver you by chilled service. The surprised thing is "a reality that any residue-prone agricultural chemicals are not detected" from the soil of the field. 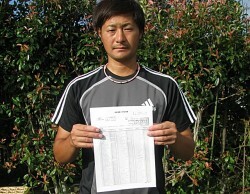 The photo is a proof. 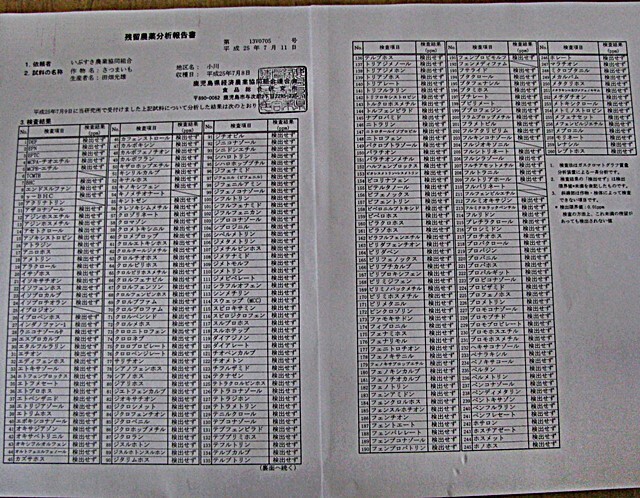 When as much as 260 Pesticide-ingredient-investigations were executed, nothing was detected every year. Why no residue-prone agricultural chemicals are detected from the soil though it is decrease pesticide cultivation (only one usage of weed-killers, as for leaf-side antiseptic dusting powders against insect pests, they use just a safe liquid we can not call it pesticide called "wood vinegar")? Although I think that the wood vinegar has no association because it should not be called pesticides, I just think that any weed-killers they sprinkle only once were "disappeared from the soil" based on the next reason. That's to say "because the soil is alive". 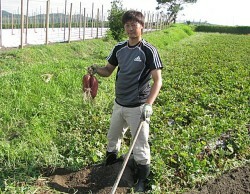 Then, what is Mr.Tabata's originality and ingenuity in order to make the soil's power strong? It is that they plow under the soil with "mustard-plants" and fish bone manure and the seaweed, and finish it the mineral-rich soil every year. 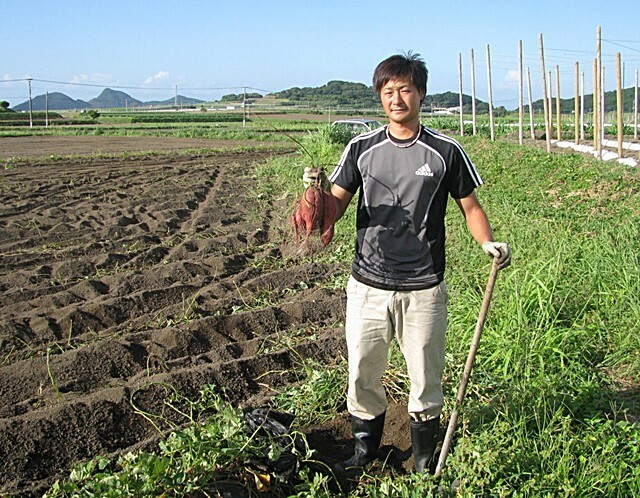 The soil of the field is mineral-riched and blessed volcanicity clay (drainage is very good, and roots are easy to open, the sweet potato is root) of a volcano called Mt.Kaimon-Dake. 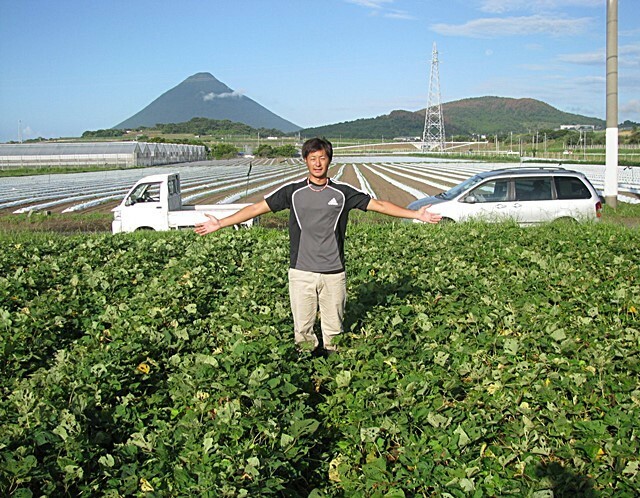 The soil made through the history of continuance being exposed to spray of the seawater (the Kuroshio Current) by typhoons is strong against insects causing damage to crops. Besides, they continue "prowing down (furrowing)" from 1990 as I said now. 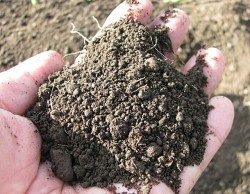 Do you feel natural that the soil is activated and strong, don't you? 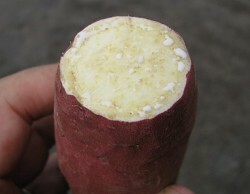 In addition, the water sprinkled on the sweet potatoes is attractive. 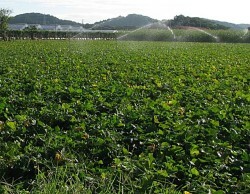 Since great irrigation construction in 1985, they continue to irrigate "Ikeda lake's water" where was about 10km straight line in distance from there. (Ikeda-Lake is the largest fresh-water lake in Kyushu, and has a rumor of "Isshie"). 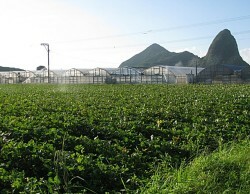 I think that it is certain that "local fresh water is suitable most to the local farm products". 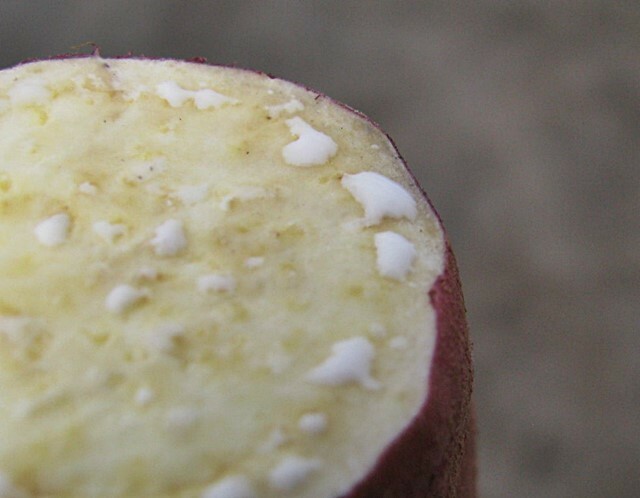 Still, their originality and ingenuityon of "a persistency about the cultivation of the seedling stage" on the growth process of the sweet potatoes is important. 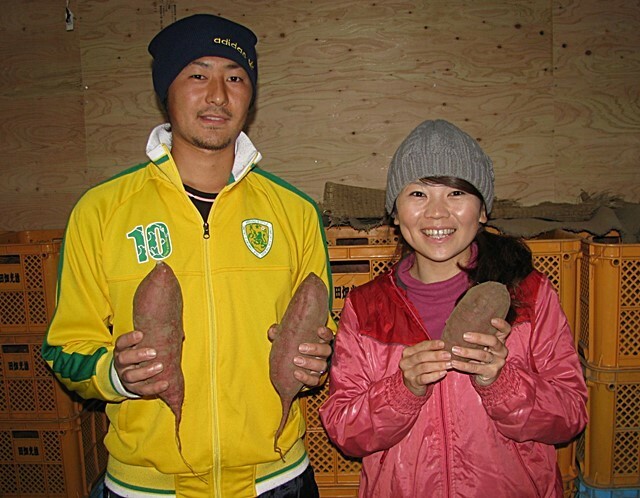 The seedlings of a sweet potato brought up carefully by them in green-houses in winter become parents (sweet-potatoes) and reward Tabata family in autumn. Furthermore, furrow width is wide as much as 110 centimeters (the average of other farmhouses' 90cm), they set up multies on the soil surface in order not to make hill harden. So, their shape is good because of such luxury cultivation methods. And still, their management after harvest is excellent, too. You know what, there are eight thermometers in their warehouse. 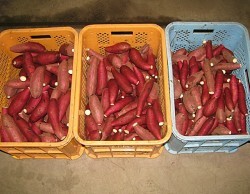 Because temperature management is very impotant for sweet-potatoes' life, they would be delight so much by their caring. 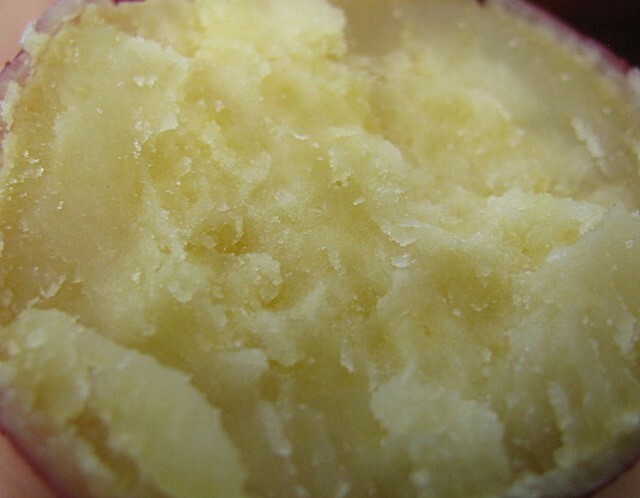 As for the preservation method, please by room-temperature preservation. 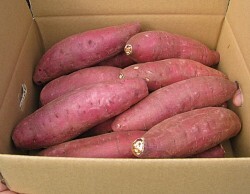 The sweet potato is a crop which is "vulnerable to cold". "Do not make it be in less than 10 degrees centigrade" (generalization), commonly said. But, in fact, the sweet potato which is vulnerable to cold "is the one in geriatric period that passed up the havesting age and was delayed (weak)". 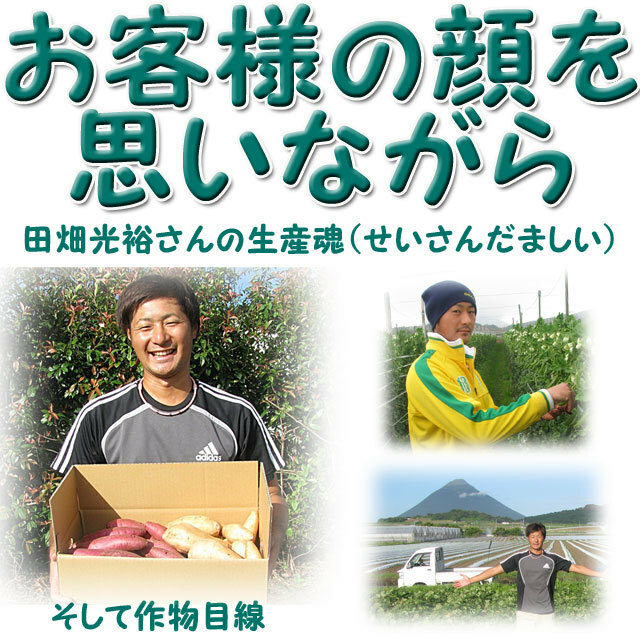 Because sweet potatoes harvested here is entirely youthful ones from 20's to 30's if I liken them to human beings, It is their merits that they can resist the coldness tolerably, and can last a long time comparatively. 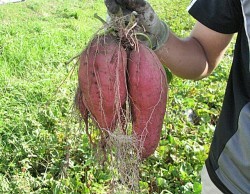 These are the sweet-potatoes cultivated by such an originality and ingenuity. Please have a shopping them in this chance.